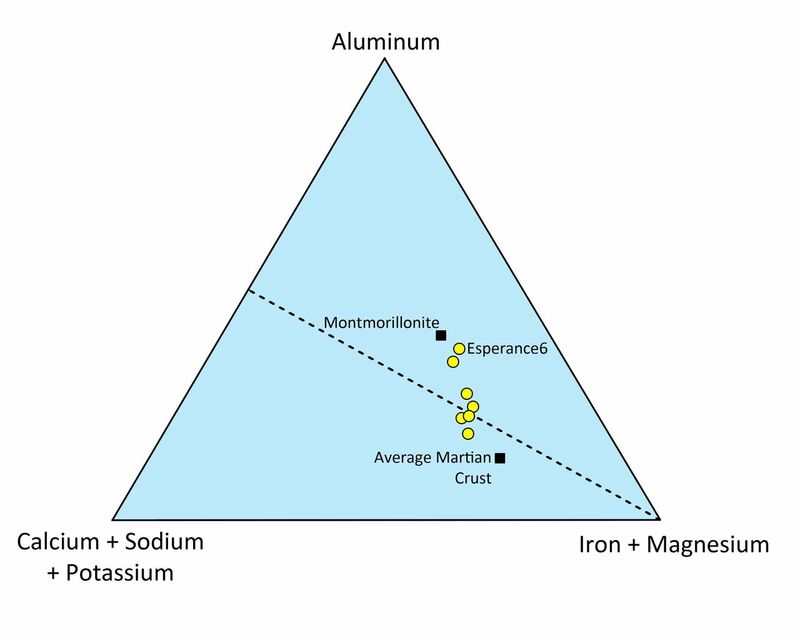 This triangle plot shows the relative concentrations of some of the major chemical elements in the Martian rock "Esperance." Some elements are summed together. 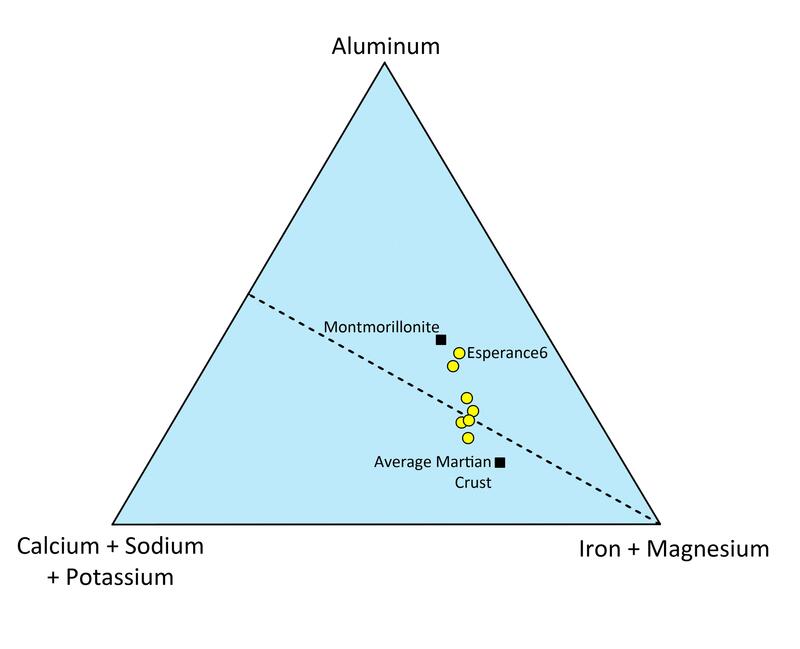 For example, a rock containing calcium, sodium and/or potassium, but no aluminum and no iron or magnesium, would plot in the lower left corner of this diagram. 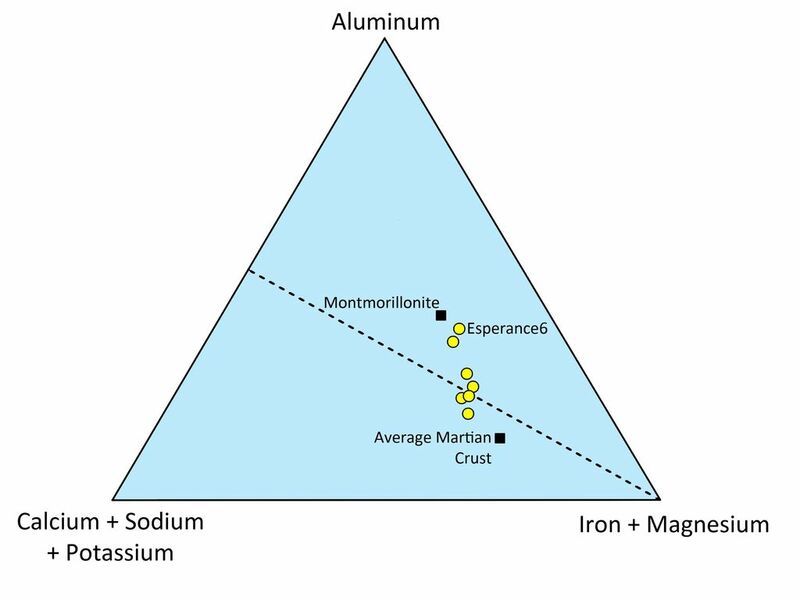 Silicate minerals that plot below the dashed line tend to be igneous, while ones that plot above it are typically dominated by clays. 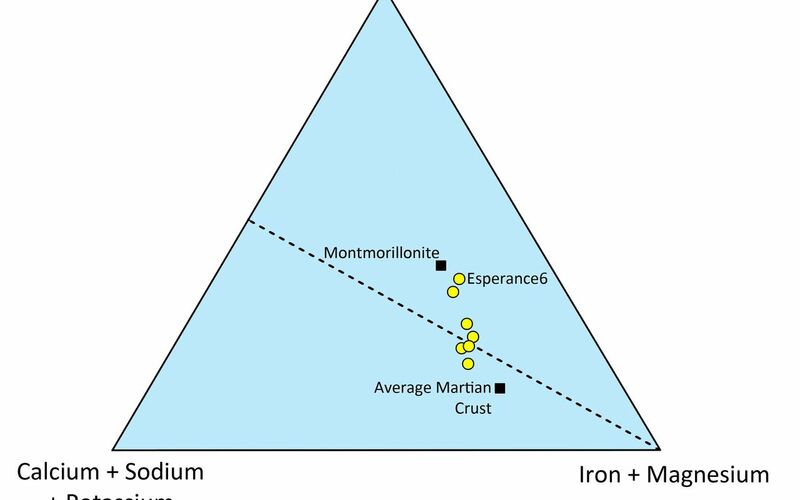 The compositions of average Martian crust and of montmorillonite, a common clay mineral, are shown. Also shown, in yellow, are measurements made on Esperance. Some Esperance measurement locations were contaminated with soil or other materials, and so they plot close to average Martian crust. The target location "Esperance6", however, was abraded with Opportunity's rock abrasion tool (RAT) and was relatively uncontaminated. Esperance6 plots close to montmorillonite, providing strong evidence for the presence of clay minerals. This image shows NASAs InSight landers domed Wind and Thermal Shield, which covers its seismometer. The image was taken on the 110th Martian day, or sol, of the mission. This video and audio diagram illustrates a seismic event detected by NASAs InSight lander on April 6, 2019, the 128th Martian day, or sol, of the mission. This image from NASAs Mars Odyssey shows large individual dunes on the floor of Kaiser Crater.